In orchestra you will learn to play the string instruments which include Violin, Viola, Cello, and Bass. We always work hard but have lots of fun playing exciting music and there are many rewards. 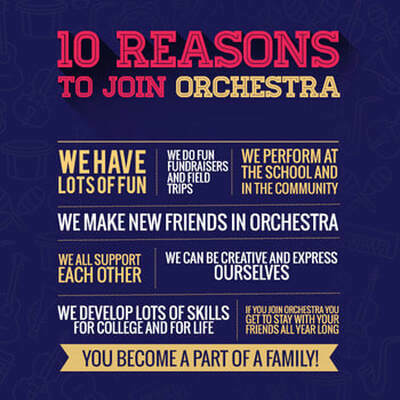 ​We perform in concerts, have special guests, and attend many field trips outside of school. The Creston Orchestra of students in grades Seven and Eight at Creston Middle School. They are under the direction of Ronald Peckham, M.Mus. The Beginning ORCHESTRA class will focus on introducing an instrument, continuing and expanding the student’s musical development while playing in an ensemble setting. Students will rehearse and perform as a string orchestra. This is a performance based class and students are expected to participate and perform in all concerts. The Intermediate ORCHESTRA class will focus on reinforcing, continuing and expanding the student’s development of music while playing in an ensemble setting. Students will rehearse and perform as a symphonic orchestra, string orchestra, chamber ensemble, and as soloists. This is a performance based class and students are expected to participate and perform in all concerts.